"AC Repair League City has never been so affordable and fast." Yes. Whenever you call or text AirVantage, you are assured of fast, friendly, and affordable service. Serving the League City area South to Galveston including Clear Lake neighborhoods, Friendswood, Pearland & Texas City. Need a new heating system to keep your home warm for our local winters? The AirVantage residential heating experts are available for FREE consultations. Their professionals will evaluate your home heating requirements and recommend the best choices to fit any budget. Give us a call today... (409) 925-6171. Fast, dependable service. When you need Air Conditioning repair service in League City and close by areas, AirVantage Cooling & Heating has the manpower & expertise to get the job done right the first time. Our technicians provide fast quality service to League City, Webster, Santa Fe, Alvin, Santa Fe, Texas City, Friendswood, Pearland & Galveston residents. Have you had a remodel lately? Allergy problems? Or are you concerned that your HVAC system isn’t running as efficiently as it once did? The average person takes 20,000 breaths per day of air that can contain particles and allergens and for children this number doubles. American Standard & AirVantage have the answer for clean air. AC Repair League City & Other Galveston County Communities. AirVantage's ac repair vehicles are often seen in League City TX, but are quickly dispatched to other Galveston County neighborhoods like Seabrook, Webster, Pearland, Friendswood and south to Texas City, Santa Fe, Dickinson, Tiki and Galveston. As a growing company... we offer all new 1st time clients a $20 discount on their first air conditioning service call. This incentive has proven invaluable to increase our customer base and build long lasting relationships. AirVantage also has a relationship with Wells Fargo and offers affordable financing for new systems. League City residents, call AirVantage today and set up an appointment for a routine check of your ac and heating system. 1st Time Customer? Let us know and you'll receive $20 bucks off your 1st service call. Awesome Service and great prices, the technician Jacob was very knowledgeable, professional and kind. He explained everything to me, took the time to answer any questions without being in a hurry. This will be my AC company from now on and Jacob will be requested as the technician to come out. Thank you AirVantage. Great AC Company! 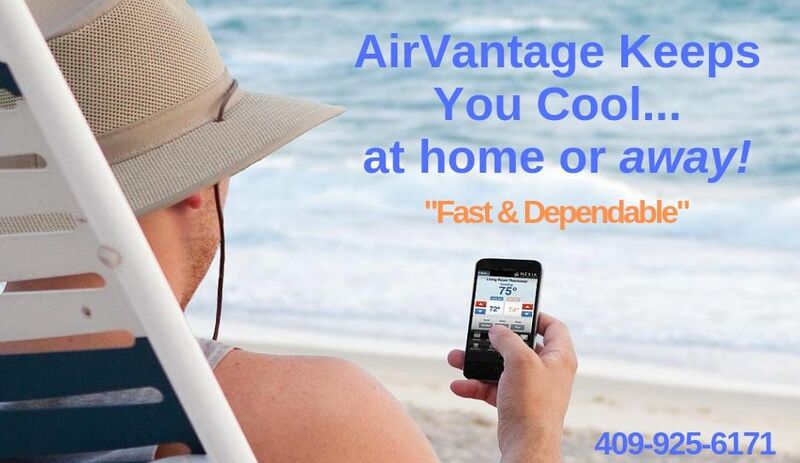 I have used AirVantage several times over the last few years with my home warranty when I moved to Tx. Our home is old and thus the appliances are as well. John and his team have been honest and fair from the beginning. The knowledge of the folks at AirVantage is wonderful and it's great to use another local business for my Dickinson AC home needs. Thanks AirVantage for keeping us cool when our AC doesn't want to! AirVantage is the only AC company I will have at my house. I have used them numerous times, always with great results. The folks at Airvantage truly care about their clients. Never have they tried to up sell anything, and have always been honest with the issue and the costs. Customer service comes at no extra cost with Air vantage. They will remain my only AC service professionals. Had AirVantage install a new system just before summer of 2016. Came out, assessed my setup, quoted a great price. Came back next day and installed. Worker was clean, fast, and friendly. It couldn't get any better! "AC went out (fortunately when it was cool) and was time to replace 16 year old unit. Had the luxury to shop around and compare. Decided on Airvantage because of personal recommendations and compatibility with existing system. Met with Mike to discuss options, he was pleasant and knowledgeable. Installed right after New Years and a follow-up a week later. Will use again and recommend"
I highly recommend AirVantage and John. His prices were competitive, his crews polite and they cleaned up everything when the job was done. There was one minor issue and they were extremely quick to respond. I had Mike come out to my home in Galveston for a check-up sometime in April. Mike found that my system was overcharged when he looked at my system. After attempting to explain why overcharging can be a bad thing he made some other adjustments and all I can say is that my system runs better, cools better and doesn't seem to cycle on and off as much and is definitely quieter. These guys are very knowledgeable and can tune your AC system to run they way it should. I really recommend AirVantage. John, I really appreciate how you have handled all my a/c service calls here in Clear Lake over the years. I like that your service techs are knowledgeable, friendly, leave my place clean and always show up on time. Great customer service. Just thought you'd like to know.